Billings Skyview's Tyler Kinghorn leaps up for a shot against Butte High on Friday at Ross J. Richardson Memorial Gym in Butte. Butte High's Clay Ferguson goes for a layup against Billings Skyview during last season's Eastern AA Tournament at Ross J. Richardson Memorial Gym in March. Skyview's Tyler Kinghorn goes up for a shot while being pressured by Butte's Trevyn Roth on Friday at Ross J. Richardson Memorial Gym. BUTTE - Billings Skyview staved off an early trip home Friday, and with a 55-44 win over Butte High Saturday morning, the Falcons will be moving on to the Class AA state boys basketball tournament. Butte High, ousted from the Eastern AA divisional tournament with this loss, didn’t go down easy though. Undersized against the Falcons’ length, the Bulldogs looked to be turning a page with an 11-10 lead after one quarter. And then in the final four minutes of the second quarter, Butte’s scrappiness fell off while the Falcons hit their stride. Center Zach Schacht dunked twice in the quarter, and teammate Tyler Kinghorn breezed by Butte defenders for a dunk of his own to cap a 12-2 run for Skyview to close out the first half. 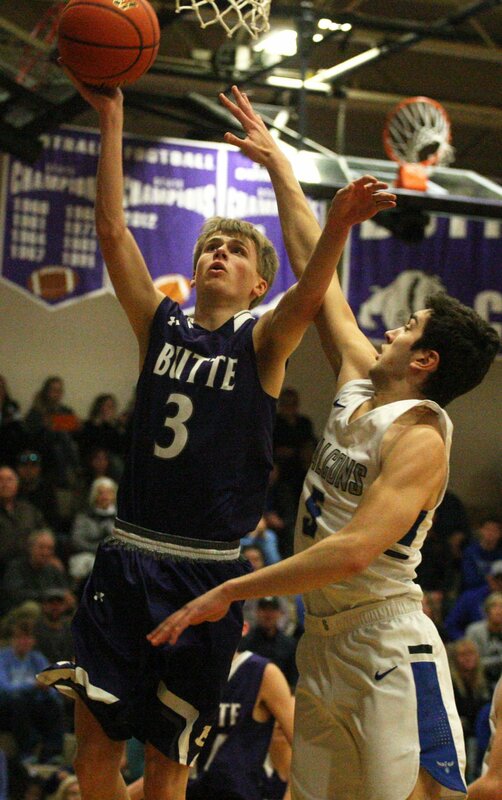 Butte (3-17) put together a 16-point fourth quarter, but the damage was done in the second and third frames for Skyview (10-10) to put the Bulldogs away. Schacht had 20 points and 11 rebounds, and Kinghorn added 18 points and 11 boards. In the third, Schacht released a measure of pent up frustration from his side’s opening loss to Bozeman when he tracked down Kash Kelly on a fast break to block his shot. He let himself get a little emotional, swiping at the air in a “get that out of here” way, and followed up with his third dunk of the game on the other end. Trevyn Roth paced Butte, scoring 15 points, all from 3-pointers. In total, Butte hit 10-of-28 tries from deep, a necessary offensive approach when giving up as much height as they were against the Falcons. Guard heavy as they are, Butte has found its identity by staying in games with clutch 3-pointing shooting the second half of the season. In its final game of the year however, the Bulldogs got out to a quick start before fading in the second quarter. By the time they found their stroke again in the second half, it was too late. Skyview will next play the loser of Billings Senior-Great Falls CMR at 9 a.m. Saturday. Great Falls CMR is moving on to the Eastern AA championship game after a 58-47 win over Billings Senior in the semifinals. Garrison Rothwell (14), Sam Vining (12) and Bryce Depping (10) scored in double digits for the Rustlers. Braxton Haws had 22 in the loss for Billings Senior. CMR will play Bozeman at 6:30 p.m. Saturday for the tournament title. Billings Senior takes on Skyview at 9 a.m. in the consolation semifinals. The Rustlers are on to the state tournament win or lose; Senior needs a win Saturday morning to advance. Bozeman got by Great Falls High, 47-44, despite a late rally from the Bison. The Hawks held a 21-11 lead through two quarters played. Robbie Simpson had 15 points for the Hawks, and teammate Mack Anderson had 11 points and 10 rebounds. Kendall Kynett led Great Falls with 13. Bozeman next plays for the Eastern AA tournament championship against top-seeded Great Falls CMR. Billings West outscored Bozeman 17-7 in the fourth quarter to relegate the Hawks to the consolation bracket and advance to the Eastern AA championship game. Shayla Montague scored 14 points to pace Billings West. Ayla Embry had 20 for Bozeman in the loss. The Golden Bears will play the Billings Senior at 8 p.m. Saturday for the Eastern AA girls basketball title. Both teams will advance to state. Led by 21 points from Kola Bad Bear, the Broncs sent Great Falls CMR to the consolation bracket with a 41-31 semifinal win. Senior led 25-23 at the half, but held the Rustlers to two points in the third quarter and six in the fourth to get the win. Addison Gardner scored 18 for CMR, 16 of which came in the first half. The Broncs will advance to state play and take on Billings West in the Eastern AA championship game. CMR will play Butte in the consolation semifinals at 10:30 a.m. Saturday. The winner of that game advances to state. Great Falls High moved one step closer to a Class AA state tournament berth, knocking off Billings Skyview, 39-38, Friday. The Rustlers outscored the Falcons 8-6 over the final frame to secure the Eastern AA consolation win. Erin Watt led all scorers with 13 points in the win. Skyview’s Kenzie Ketchum had 12, and teammate Neveaeh Alden had 11. The game started more than a half hour late, after both teams showed up to the HPER Complex wearing their dark jerseys. Great Falls will play Bozeman at 9 a.m. Saturday. The winner moves on to the state tournament. March 1-3, 2018 from Ross Richardson Gymnasium at Butte High School. Top 4 teams advance.